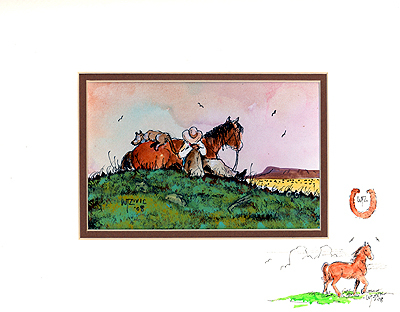 This piece depicts a tired cowboy taking a nap beside his weary horse and trusty dog. Daily life in the Old West was not an easy one ... and this painting captures a rare quiet moment in the life of a working cowboy. In all the years of painting horses, Mr. Zivic says this is the very first time he has ever painted a horse lying down.